Middle English- via Old French from Latin “geometria”, from Greek, gē ‘earth’+ metria ‘measurement’. Earth Measurement. This sounds like something entirely different from most of our own experiences with Geometry in school, yes? Over thousands of years, geometry has become a standard part of math class and yet it sits in the modern math curriculum isolated from its true origin. Ancient scholars, the first geometers, understood geometry to be the act of measuring the complete human experience of living on Earth. They set out on this study in order to understand the design behind everything they were experiencing in the physical world. In ancient Greece, the latin word “Mathematikos” meant “desire to learn” and the latin word “mathema” meant “knowledge/study.” In other words, the measurement and study of the physical world in order to understand the human experience on earth and how everything around us is created. Rudolf Steiner and Waldorf education place the utmost importance on the Geometry curriculum and have created a different path for students than the typical math curriculum offers. In truth, in Waldorf schools children begin their study of “earth measurement” with their first lesson on the first day of first grade - by drawing straight lines and curved lines. Straight lines and curved lines are nature’s design tools and they will become the essential building blocks of writing and drawing. Printing, cursive, numbers, and music notation are constructed with lines and arcs. As the students progress through the early grades, patterns of lines and arcs are part of almost every lesson. Where there are patterns, there is geometry. Clapping games establish rhythm and order. Eurythmy and dance involve expression by way of patterns in movement. Students sit in rows, circle up, and line up. Music and geometry go hand in hand as well. Rhythm, intervals, and patterns are the geometric design of music and poetry. As the students learn more about music, they can observe how different geometric patterns in music have unique qualities that induce a particular mood or feeling. Major chords sound “happy” and minor chords sound “sad.” The interval between a root note and the 5th sounds and feels much different than the interval between the root note and the seventh. Music is a great example of geometry as the tool behind the expression through sound. The idea of math as a universal language actually goes much deeper than numbers and calculations on paper being the same everywhere in the world. Ideally, a child’s education in the early grades is full of geometry. In grades one through four, there is no formal geometry class. Geometry comes by way of everyday school life (music, writing, movement, etc) and Form Drawing class. Forms are patterns of straight and curved lines that become more complex as the children advance through the grades. Simple repeating forms in grades one and two help with the development of coordination for printing and cursive writing. More complex forms in grades three and four help to develop a sense of spatial awareness and symmetry. In the fourth grade, students practice forms that are also symbols from different cultures (i.e. Nordic symbols) and learn how to tie knots - a three dimensional version of the form drawings. Grade five is a special, transitional year, symbolic of the peek of childhood. The students study great civilizations of the past, including the “Golden Age” of Greece. The students themselves are in the golden age of childhood. They are at the peak of their development in their child bodies and have gained as much mastery of their physical bodies as they are going to before heading into puberty. Fifth grade also marks the transition from form drawing to geometry. The goal of grade five “freehand geometry” is to lock the archetypal geometric forms into the body by drawing them without the use of tools. Classes also set out to find geometric forms in the world outside of their classrooms. With the arrival of adolescence, grade six becomes a year of re-birth both physically and in the curriculum. In geometry, we need to go all the way back to the beginning with straight lines and curved lines. This time, however, the children learn to construct lines and arcs with geometric drawing tools. A straightedge (ruler) constructs a line and a compass constructs an arc. The students will now begin a second journey through geometry that mirrors grades 1-5. The three-fold approach to learning (doing, feeling, thinking) is beautifully displayed in the geometry curriculum. In grade 6, the focus is on the physical doing aspect of learning. Learning to use tools to construct and measure is a physical task and it challenges the students as they begin to develop new physical bodies. The focus on “doing” in grade six mirrors the 1st and 2nd grade curriculum where an understanding of lines, arcs, and patterns comes from drawing forms with both the hands and feet, walking patterns, and rhythmic clapping games, etc. Grade Seven in Waldorf schools is generally thought of as “the year of exploration.” A seventh grader, now fully immersed in adolescence, is ready to outwardly explore the physical world and inwardly begin an exploration of the question “who am I?” The feeling life of the seventh grader takes center stage in the curriculum as we use geometry to understand the human body and the natural world we live in. Da Vinci’s Vitruvian Man and the work of Fibonacci give us clues about the mathematical formula behind all that is living on our planet. It’s an incredible moment when students discover that the same ratios and patterns found in pentagrams, roses, apples, insects, hurricanes, and the milky way galaxy, are also found in the structure of our own bodies. The observational studies of nature performed by the likes of Plato, Pythagoras, Eratosthenes, Fibonacci, and Leonardo Da Vinci are mirrored by the observational powers of the seventh grader (they see everything, yes?). 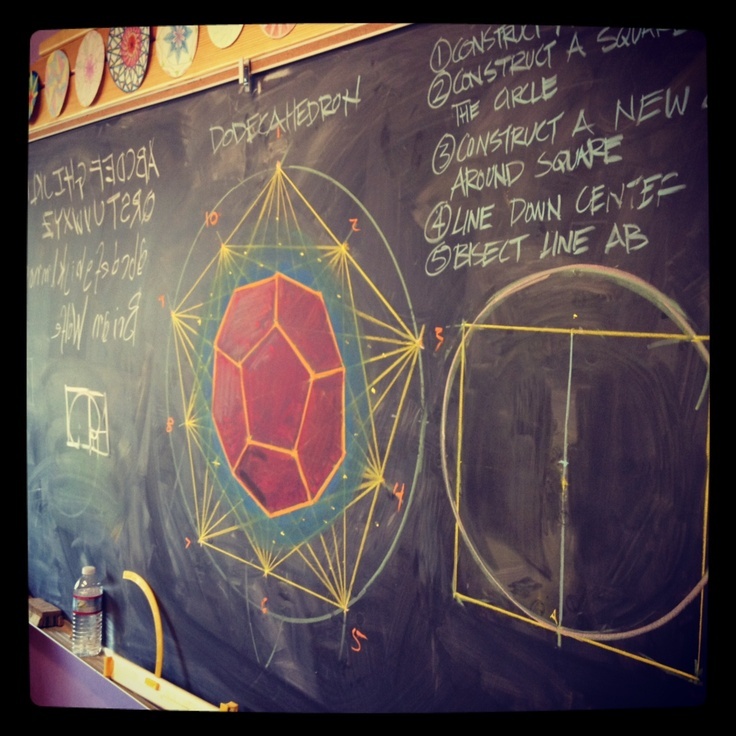 In grade eight, the geometry curriculum enters the thinking realm. Armed with knowledge about how to use the tools of the geometer and the experience of searching for one’s self both in nature and the human body, the students are ready to become mathematicians, in the ancient Greek spirit of the mathematician being one who studies all things. We can now venture into the world of abstract thought and theory. The students will grapple with how to measure and study the three dimensional world on the two dimensional surface of the paper. By the 8th grade, it is the hope that students can see that there is always more than meets the eye, and they now have the physical and intellectual tools to dig deeper through observation, making precise measurements and calculations, and articulately describing what they see. They are mathematicians, scientists, and philosophers training to see things on multiple levels. On one level, numbers define quantities and help us with measurements and calculations. On another level, each number has its own unique set of qualities. Like the circle, the number one represents wholeness and the beginning. Plato called the circle “the mother of all shapes.” When the whole is cut into two, polarities are created (up, down, left, right, life, death, hot cold, positive, negative, male, female, etc.). The number three has a very balanced quality (tripods, tricycles, triangles). This way of understanding the quality of numbers is similar to the phenomenological way of teaching science. When a botany student imagines a plant, the goal of the teacher is to get the child to have a fluid mental picture that includes the entire life cycle of the plant, as opposed to just a fixed image of the plant in a particular moment in time. With geometry, the goal for the 8th grader is to help them think of numbers not just as quantities but as parts of patterns in nature with their own qualities that shape the world around us and our experience of the world. •We created a 3 page Qualities of Numbers reference guide for you! Tell us where to send yours in the form below. •We offer a comprehensive Geometry curriculum, covering the grades 5-8. Learn more about our geometry program! Brian is teaming up with fellow Waldorf teacher, Caitlin Amajor, for this G5-8 series! We have a FAQ page here, where you can learn more about this artistic, inspired program. Registration opens on July 15th! Courses begin on Sept. 3rd. There is also a link to a new free lesson on the FAQ page. Waldorf teacher Amanda Mercer has been busy creating a beautifully supportive program for the Waldorfish community! This video series will guide parents & teachers on a journey through each primary color via wet-on-wet painting techniques & original verses. G2 and G3 courses are in the pipeline as well, although release dates for these are not set yet. The G1 course is OPEN for enrollment! Learn more about it, here! We're teaming up with storyteller Sara Logan for this new course! 10 original/adapted stories paired with art lessons to carry your family through the full circle of a festival year!! This course is ideal for families who have previously participated in the Weekly Art program, or those looking for less frequent art lessons than offered in our other programs. NOTE: this program will initially only be available to WA students currently enrolled in the '17-18 session. It will become available to the whole community in time for the '18 Advent season! 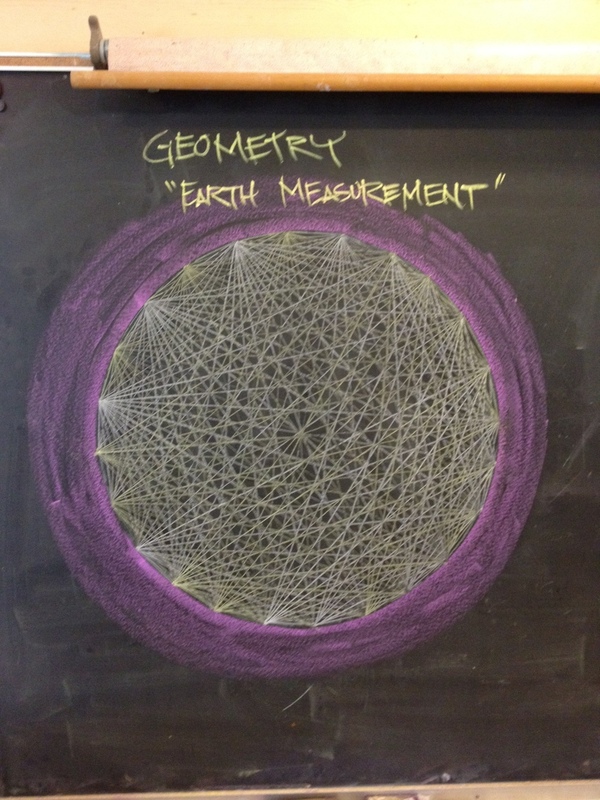 chalk art :: geometry "earth measurement"